When Rubi Mancia made the move from her remote mountain community in Honduras to La Esperanza, a city three hours away, she thought she was boosting her chances of finding a job. But, as it is for so many people her age, employment was nowhere to be found. Two thirds of the Honduran population is less than 30 years-old and the Honduran job market has not been able to keep up. Many youth from poor rural areas leave for cities or nearby countries in search of paid work. There, it’s all too easy to become targets of violence or get swept up into the pervasive gang activities that make the Northern Triangle region of Central America one of the most violent places in the world. The effects of this massive youth out-migration are deeply felt in the communities they leave behind. Without younger family members taking part in farming and related work, the food security of entire communities is at risk. In Rubi’s case, she went to the big city to look for employment. The solution, it turns out, was at home. USC Canada has been working in collaboration with our Honduran partner, the Foundation for Participatory Research with Honduran Farmers (FIPAH) for 14 years in three regions. Early on it became clear that for any of the work the partnership does with farmers around seed diversity and ecological farming to have any lasting impact, young people must have a chance to play meaningful and productive roles in their communities. With support through USC Canada’s Seeds of Survival program, FIPAH has helped establish 130 farmer research teams – 37 of which are teams of dynamic young farmers. They have been learning ecological farming and agroecology techniques and developing ways of bringing their crops to market. Last year, 179 young people in Yorito and Otoro took part in hands-on workshops to learn how to produce organic fertilizers and pesticides. They also had training in starting businesses, organizing coops, bookkeeping and administrative management. When Rubi found no work in La Esperanza, she returned to her hometown and joined her local FIPAH farmer research team. With the support of the group she obtained credit to start a grocery store. 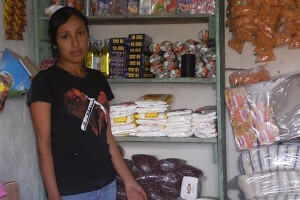 Rubi’s store now sells products from her own community, like grains and seasonal vegetables. Youth groups like the one Rubi is a part of have established alternative credit and financing systems for a coffee nursery and a maize and bean storage facility. The facility allows local people the chance to purchase community grain supplies at fair prices. Meaningful and productive work is still far too hard to come by for too many young people in Honduras. But for young people like Rubi Mancia, opportunity and hope are growing. The goal of USC Canada’s Seeds of Survival Program is to ensure a secure source of food and livelihood for small-scale farmers and to promote crop diversity. Seeds of Survival stresses the importance of building upon small-scale farmers’ time-tested local knowledge and techniques, limiting the need for outside farming methods that often don’t work with local growing conditions. A key component of the program is building collaborative relationships between farmers, scientists, governments and local NGO workers. USC Canada’s Ottawa-based program managers travel overseas as needed, but the organization does not send Canadians to work or volunteer in program countries. Instead, USC Canada works through local independent partner organizations, or when that is not possible, through employees hired locally. Farmers are knowledgeable producers who, for a host of reasons including climate change, are finding it hard to maintain the diversity and innovation at the heart of their food security. Traditional local crop varieties are affordable, often more nutritious, and better adapted to challenging growing conditions than varieties that are not native to a region. Farmers are local experts and play as important a role in improving productivity as agricultural scientists. Women and young people play a critical role in farming, and their contribution, both as farmers and leaders, must be valued if we are to achieve sustainable and vibrant rural economies. Seeds of Survival is a global program with projects in 11 Global South countries. In 2013, USC Canada partnered with Seeds of Diversity Canada to bring the Seeds of Survival approach home to Canada.